The food menu is inspired by travels down the highways of India and the eccentric by-lanes of old towns famous for unique age-old recipes. Dhaba Estd 1986 Delhi by Azure Hospitality is all set to land itself at Delhi’s posh new Aerocity. The award winning deliciousness carries forward the thirty year legacy as it stamps another one at Delhi’s most favourite leisure destinations, The Walk at Aerocity. At Dhaba Estd 1986 Delhi, one not only experiences fabulous Dhaba food but from the moment you enter till the time of your exit, the ambience recreates unparalleled highway eatery nostalgia. 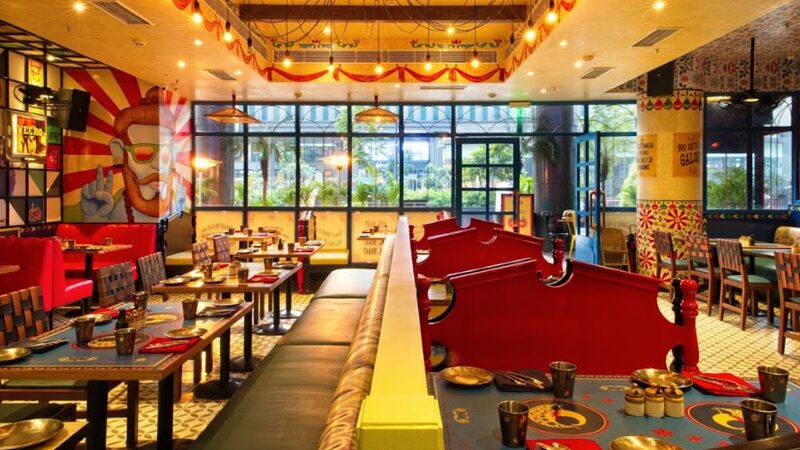 Given a shot of new age fun and kitschy interiors with the legendary classics on the menu along with some nouveau beauties - Dhaba is set to recreate the same magic again - but with more full-on Punjabi flair. “We are thrilled to share that Delhi’s prime food, beverage and leisure destination Worldmark at Aerocity is about to get struck with Dhaba’s dildaar Punjabi love that has been warmly accepted in Delhi NCR, Pune, Chennai, Hyderabad & Bangalore, ” Rahul Khanna & Kabir Suri, Directors, Azure Hospitality. Dhaba comes in a new avatar with signature kitschy quirk, vintage collages and retro Indian décor of the 80s and 90s, and use of popular Indian weaving techniques in ikat fabrics. Designed by Mr Atul Anand, this 52-seater outlet showcases environmental friendly décor using recycled elements and community tables for group seating. The ambience effortlessly infuses the excitement of a highway meal; and in fact, takes it up a fair few notches! The creative chaos of colours, quirky desi quotes, revival of vintage black and white Bollywood posters and the signature truck art adds to the overall dining experience. The mood of the restaurant is further enhanced by the mock façade of a building, which is designed like a small town. With a crafted legacy of over 30 years, the real highway magic always takes place in the kitchen. With a legendary classic Indian menu divided into three drooling parts- the Tandoor, Tawa and Patila, food at Dhaba will be a true showstopper amongst corporate and tourists visiting the location. Chef Ravi Saxena expertly helms the Dhaba kitchen chronicle, reconditioning its fabled signature recipes bringing forth the best of highway cuisine and North Indian cuisine concepts. With signature Recipes Since 1986 and the new experimental Highway Specials, there are a whole lot of new and signature dishes for everyone to try. The food menu is inspired by travels down the highways of India and the eccentric by-lanes of old towns famous for unique age-old recipes. In addition to the age –old classics, the new menu experiments with newer flavours showcasing Highway specials, not only from Punjab but from all over the country. The essence and soul of Dhaba is Punjabi, however a whole range of regional dishes are now available for indulgence. Dhaba is all about fun times and great food in true Punjabi style- so don’t hold back, roll up your sleeves and as we say, enjoy swag anusaar!